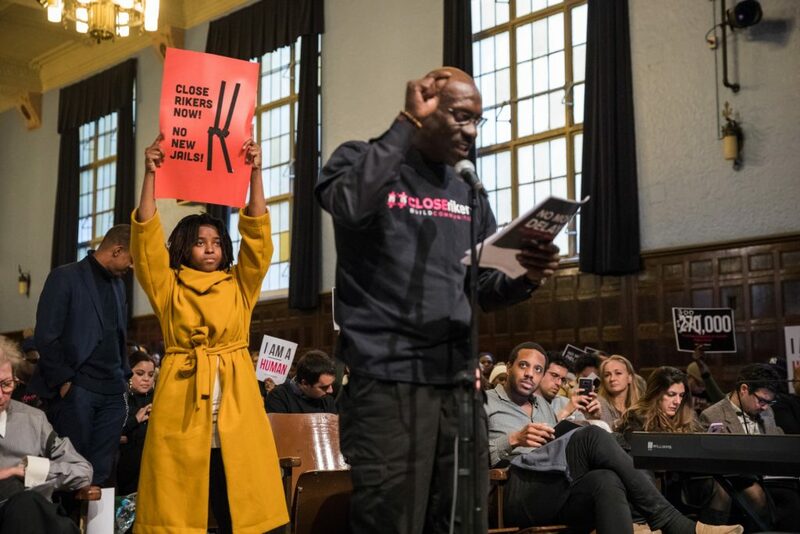 The city held its first public hearing on the planned expansion of a Brooklyn jail Thursday night, with many community members giving emotional testimony about their own detention on Rikers Island and the moral imperative to shut down the scandal-ridden jail complex. The community hearing, which kicked off the jail’s Uniform Land Use Review Procedure (or ULURP), ran from 5:00 p.m. to 9:00 p.m. It was hosted by Bishop Loughlin Memorial High School in Clinton Hill. The Mayor’s Office of Criminal Justice (MOCJ) along with the Department of Corrections presented the city’s proposal to rebuild and more than double the size of the current Brooklyn Detention Complex — an 11-story, 170-foot-tall building in Boerum Hill built in 1956. Many formerly incarcerated people recalled harrowing experiences on Rikers Island and expressed support for the borough-based jail proposed by the city — with caveats. Darren Mack was on Rikers Island as a teenager in the early ’90s, when the detained population hovered around 20,000. He said the worst thing he saw was abuse of power by DOC staff. “I saw people getting killed by staff. Beaten to death and no one held accountable. They’ve proven unable to create a safe environment,” he said. He came to the hearing with a group called JustLeadershipUSA, a national organization seeking to cut the incarcerated population in half by 2030. Mack and other organizers with JLUSA believe that DOC should not have complete control running the new jails and that people with serious mental health issues should not be incarcerated, but should get the mental health services they need in a therapeutic environment. In spurts of debate with JLUSA was a vocal contingent of members from No New Jails NYC, who agreed that closing Rikers Island is imperative, but believe that building any jails is a misuse of city money. “If they build it, they will fill it,” the group chanted throughout the hearing. “To close Rikers, we need to find real solutions to deal with the root causes of harm and why in the first place people do harm,” said Brittany Williams, a member of No New Jails NYC. “I think we’re asking the wrong questions. What do our communities need instead of 5,000 cops in schools and new jails?” she asked. “We don’t need a kinder, gentler version of mass incarceration. We need no incarceration,” said Justin Cohen, who suggested the mayor use the $11 billion instead to fix NYCHA, transit and New York City public schools. Others at the hearing slammed the towering height of the proposed jail, calling it out of character with the rest of Boerum Hill’s architecture. One woman, a resident of Downtown Brooklyn, did not mention the incarcerated population, but still implored Community Board 2 to reject the mayor’s plan. “The new jail is nine times as large, completely out of context with the rest of the neighborhood. It’s a monolith,” she said. State Sen. Velmanette Montgomery, State Assemblymember Jo Anne Simon and Councilmember Stephen Levin all spoke at the hearing. Montgomery said if anything, the city should make Brooklyn Detention Complex smaller. “We sure don’t need the one in Brooklyn doubled in size. At least we can honestly ask that whatever your plan does or does not include, it should not include a 40-story building,” she said. CB2 will consider the proposal at its May 8 general meeting and decide on its recommendations to the City Planning Commission.